Amber M. Moran is heavily influenced by her tropical setting in her small coastal Florida town. She combines watercolor and ink creating a unique and colorful take on the coastal lifestyle. She illustrates with black ink over top of many watercolor layers and extends it out onto a mat, creating a “window of color". 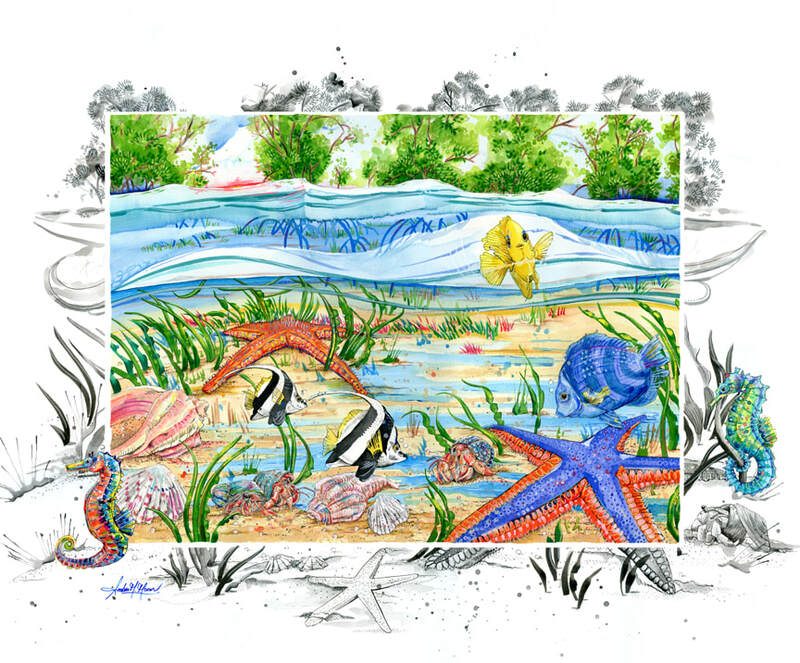 "Water is included in almost every aspect of Florida life so I love that I can bring watercolors into my work to make it look and feel more fluid-like. I want the viewer to be drawn into each painting. I'm in love with the vastness of the ocean, the mystery of our Florida canals and rivers and the peacefulness of the bush where the only sound is of the palms blowing in the wind." The Martin Artisans Guild - 1st Pop-Up Exhibit - Saturday, April 13, 2019 10AM-5PM. 15-20 Artists - paintings, jewelry, ceramics and fiber arts.